In my initial consultation with Jenny she chose classic, traditional and antique to best describe her wedding style. Soft pinks and Ivory were her two main wedding colours complemented by navy blue bridesmaids dresses and decor accents. Together we decided on flowers that really spoke to her classic style. 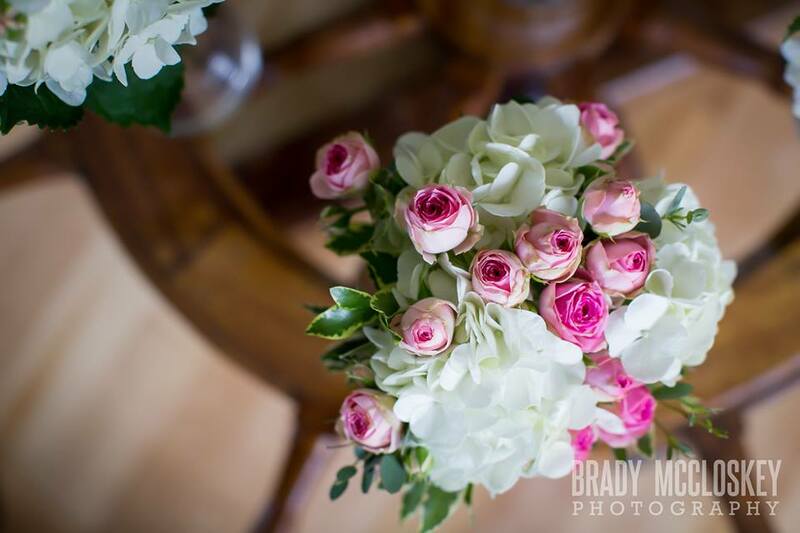 Photographed by Brady McCloskey Photography, Hydrangea, Vendela Roses and both pale pink and blush pink Spray Roses set the mood for this couples day. Variegated New Zealand Pittosporum and lace accented her hand-tied bouquets by emphasizing an antique look, while Gunni Eucalyptus worked to integrate that feeling of navy blue into the floral bouquets. Vintage teacups were placed at each table setting to add an extra antique touch to the reception space, along with a vintage teacup that her Grandmother had given her to use as a cake top. 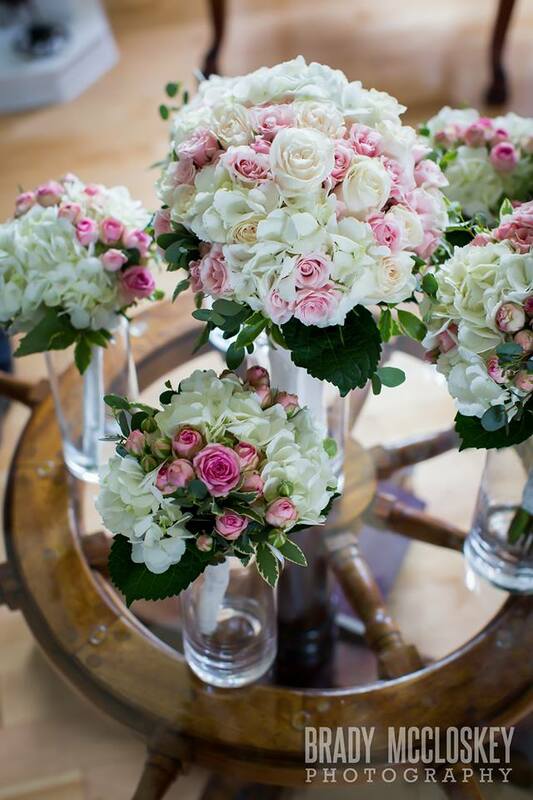 The table centrepieces consisted of a string of pearls with miniature, loosely hand-tied bouquets of Hydrangea and Spray Roses, arranged in low vases with pearlized glass rocks. 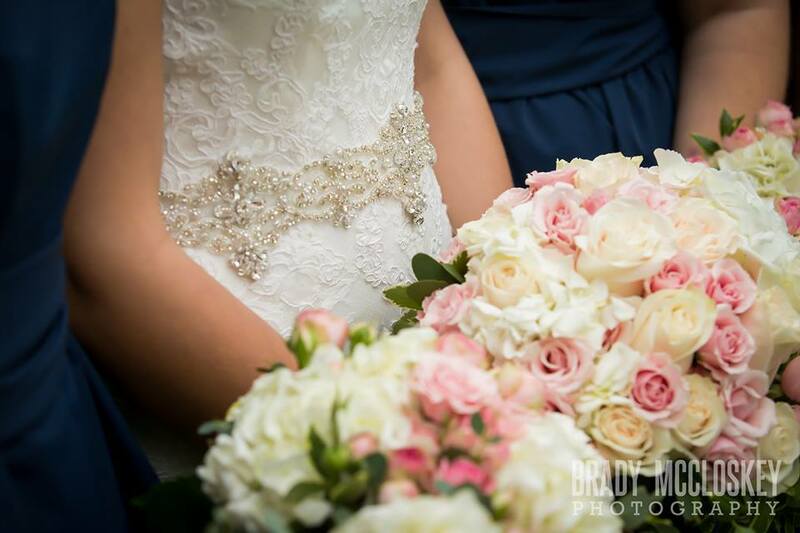 Check out Brady’s photos of this wedding on Facebook! Beautiful work! Hope to work with you again soon!